To help you navigate the world of foils we’ve compiled a buyer’s guide to some of the latest offerings on the market, but first Sam Ross gives us the answers to some foiling FAQs. It seems that whether it’s sailing, kite or windsurfing, foiling is well and truly the word for 2017. Minimum level would be a competent freerider who is in both straps blasting comfortably. They would need to be able to sail in outboard footstrap positions on a wide style board. Whilst this will benefit all windsurfers at this level in terms of learning something new, or gaining a fantastic experience, it has most benefit to heavyweight riders who want to get more out of lighter winds. I currently use two sail sizes down from what I’d normally be on. So I’d be using around a 6m in 7.5 weather, a 4.4 in 5.2 weather and so on. The lightest I’ve foiled in is 6 knots on a 7.8, but for comfortable performance, 8-10 knots is great. The finbox on foil suitable boards needs to be deep tuttle. This would be found on most slalom and Formula boards from the last few years. Many brands have stated that you would need finbox reinforcement. This may well be true for long term durability but I haven’t come across this problem yet. Brands are now releasing foil specific boards and foil ready boards. Foil ready boards have an already reinforced fin box. Specific foil boards tend to be tweaks on wide slalom designs with a bit of double concave to help with nose diving. The biggest tweak tends to be the width in footstrap placement. Ideally a wide strap spread helps with control when really loading up the foil. This is by far the most important aspect on a foil board. More width means more control of the lift. Boards need to be over 70 cm wide at least but best is 80 cm+, especially if using bigger rigs over 6m for example. 71-80 cm wide boards are ok with rigs up to 6m but above this you are too close to the rig and also unable to maintain good leverage on the foil. Boards over 90 cm and even Formula boards give you even more control over the foil. The two main foil boards I use are 80 and 95 cm wide. For teaching I prefer the 80 cm wide board to begin with. For foil students the width tends to be more compatible with the smaller sail sizes being used when learning to foil and also is a more similar width to boards that students will have used before. When sailing powered I much prefer the 95cm board. I’ve also been using a Formula board, which gives the ultimate control; track position can be an issue though. The Starboard 147 gives all the benefits of the wide board at 95 cm wide with good bottom shape for nose diving and lots of footstrap positions, which has made a massive difference in comfort on the foil. Especially when going flat out downwind. I’ve used boards from 105 – 170 litres for foiling. Once in the air volume has no impact but does have a huge impact on getting going in lighter winds. For the sailor you want at least +10 to +15 litres of reserve volume once you’ve taken into account sailor and rig weight. My main board for teaching has been a 120 x 80 and has worked for most sailors, although heavyweights have got on much better with the 145 and 95cm wide board. Best track position tends to be a long way back. 110 cm from the front of the finbox helps with lift but also height control. However some of the specific foil boards are now moving tracks back so I have started moving my mastfoot forward again. For example, the Starboard 147 foil board’s mast track is a little further back so you have more tuning options. Also as you can spread the straps wider you can move the mastfoot further forward. Outboard increases control massively, especially if the board is a little narrow. To begin with smaller straps will help with control especially the back strap. When looking to gybe, increasing the size of the front strap will make carving the foil much easier. Wide stance makes a massive difference in trim control. My favoured setup is back strap as far back and outboard as possible, front strap as far forward as it will go. This really helps, especially when getting too much lift and also heeling to windward. Between different manufacturers almost all items vary although there are many similar trends. Mast length, fuselage length, wing size, shape and position are your main factors when looking at foils. The front wing type is probably the biggest decision to make. Most manufacturers make 2 or three wings. If they make 2 then the large front wing is normally around 800 sq. cm and will be best for getting up early in lighter airs. Where manufacturers make three wings then if you’re heavier the largest wing might be the best option for maximum lift whilst the middle wing a good light wind option for lighter riders. To start with, lift helps the learning process and also helps you cover the lightest wind range or even get out on smaller sails earlier. If you’re looking to foil in higher winds or go faster then you can always add small wings in the future. Mast length may or may not be an option. For top performance, longer masts, typically 95-100 cm are best. They give you higher ride heights, work well in swell and allow you to go faster. Shorter masts are around 75-85 cms and tend to be a little better when learning, as you get a feel for the length of the foil more quickly and when you do crash you won’t be as high. Fuselage length will control stability, but the key ingredient here is how far apart your wings are. The further apart the wings the more stability you’ll have. The further forward the front wing on the fuselage, or from the mast, the more lift you’ll have under your front foot. The closer to the mast or further back the wings, the more lift you’ll have through your back foot. Wings closer together or shorter fuselages will increase manoeuvrability, whilst sacrificing some longitudinal stability. Currently all the above variations come in full carbon setups and also alloy / carbon or even alloy / G10 variations. If you’re looking at travelling a lot with your foil the alloy /carbon or alloy / G10 combinations tend to be the setups you can fully pack down and remove the mast from the fuselage for easier transport. You don’t need a specific foil board for foiling but it may well unlock more performance, especially if you want to sail on bigger rigs in lighter airs or use bigger rigs more powered up. AHD proudly introduces its new foil range for DTT (Deep Tuttle) fin boxes. Dedicated to windsurfing performance in light / medium winds, the AFS-2 range is the result of 2 years development with our world-class (America’s Cup) engineers and is built in Brittany. This new range compliments our AFS-1 Wind / SUPFoil (with outstanding low speed lift, available since 2009), to bring you amazing new sensations by flying much faster in higher winds. 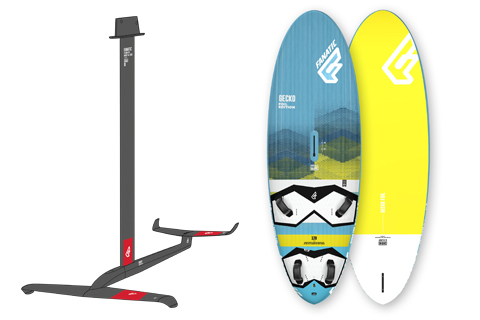 The AFS-2 range and our SL2 / SL3 boards are perfectly evolved for Freerace / Slalom / Race foiling, offering every rider accessible high performance with modest rigs in 9 to 30+ knots wind, with Vmax 30+ knots targeted (with medium front wing 700mm). The AFS-2’s construction is Hi-Modulus T700 Pre-Preg full Carbon, guaranteeing amazing strength and stiffness that is the main key to opening the performance door! Great attention has been paid to the connections between wings and fuselage to optimize stability and hydro-dynamics. The fuselage is also very stiff and with the optimal length between the wings to stabilize the flight at high speed it delivers a huge bonus to your performance and control. As pioneers with almost 10 years Wind / SUPfoiling experience on the AFS-1, offering the public the ultimate in low speed lift for the last 8 years, we have of course used our experience and knowledge to compliment this with the fastest and most accessible foils available for Windfoiling! 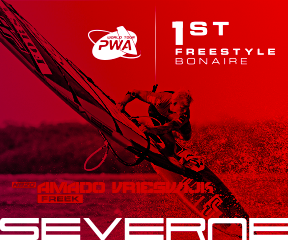 The last GPS official results really blew people’s minds (PWA rider Julien Quentel – Speed Base Brest – 1st attempt June 10th – 27+ knots / 500m – www.basevitessebrest.com/resultat.html), and we are talking about the medium size 700 front wing offering the largest range of use from 9 to 30 knots wind with recommended sails from 9.5m to 5.0m. 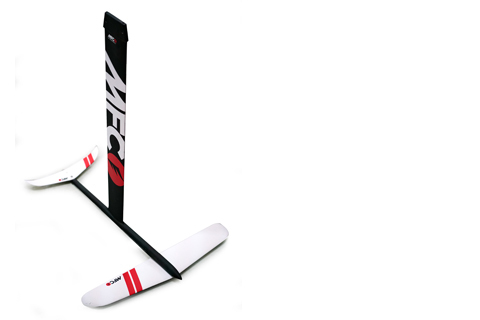 Specifically designed to fit any existing or future design of windsurfer with a Deep Tuttle finbox, the AFS-2 features: Shaft (Mast) 92.5cm, Fuselage 85cm, Front wings 800, 700 or 550mm. Total weight 3.5kg. While developing the AFS-2, we paid critical attention to every detail of our SL2 Freerace / Slalom and SL3 Slalom / Race boards to ensure that not only did they deliver exceptional performance / control with normal fins, but the required immense strength needed for foiling! They all feature our Double Carbon Full Sandwich, with substantial re-engineering to control the immense torsional and bending moments encountered when foiling, meaning you can ride our boards and foils in the confident knowledge that we have set out to deliver to you, the very best foiling experience possible. “No limits! Even now, I keep improving my performance, session after session! Foiling is seriously addictive and surely will provide ever greater sensations and performance into the Windsurfing world! We decided to focus all our attention on the entry-level part of foiling for the moment, in accessibility, durability and price. So we worked on an affordable but robust high-grade aluminium mast and compound composite wings and fuselage. Our goal was to develop a foil which is simple to use, affordable, but also can withstand the high forces exerted on a foil by windsurf foiling. And also make sure the fuselage and wings are made of very durable materials, as one of the biggest problems entry-level foilers face, is breaking wings/fuselages. In addition we developed the Gecko Foil edition in 133 and 120 litre sizes. 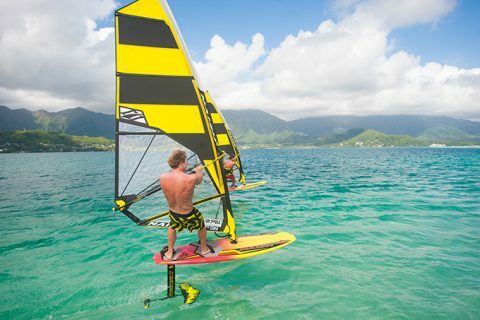 Switching effortlessly between a Freeride windsurfer and a Foil board, it offers everything you need to just have fun! 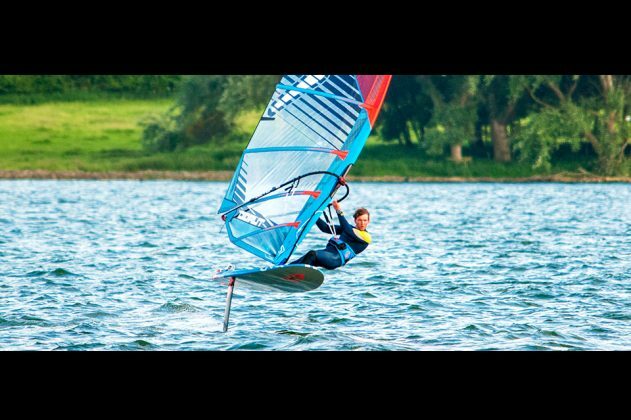 Our Flow H9 was developed by ex windsurfing champion Ken Winner, who develops the North kites and foils. 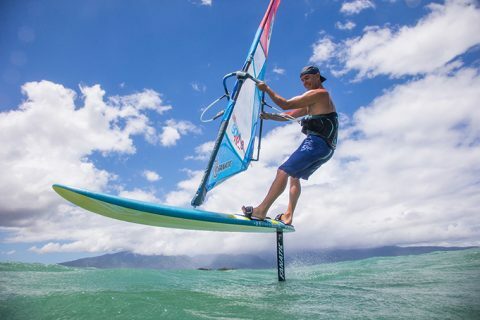 Tested on Maui and using all the R&D knowledge of the latest foiling developments in Kite, Windsurf and SUP, this was a great fast track to develop a very easy to use foil, which still has great performance. We wanted the foil to work in as low wind as possible, with the smallest sail size possible, as close to the target average user would use it. The construction is “Made in Germany”; all materials sourced in Germany, consulted and manufactured mast and plate in Germany. We used Formula 1 Fusion Technology: a technical approach from motorsports and aviation, a combination of ‘glueing’ and screwing and laboratory tests on material surfaces and glues at 3M. We used screw lock inserts that are used in Harley Davidson engines to protect against vibrations, prevent unscrewing during riding and using stainless steel to prevent corrosion in the Alu. mast. Our wings and fuselage are made of Carbon Compound: recycled carbon fibres with a Polyamide matrix as a substrate used in a moulding process. Our foil is supplied with a complementary foil bag which allows the complete foil to be packed away for transport, but also converts to a cover for when the foil is fully assembled. A special feature is our “Wedge” in the rear wing, which allows riders to adjust the angle of the wings, to alternate between early lift or stability, depending on the rider’s ability. Overall a great package which is excellent value for money, targeted at the main group of entry-level foilers. We see the future of foiling in windsurfing as revolutionising light wind windsurfing. Many windsurfers do not have the budget to buy expensive and difficult to use large rigs and boards, whilst the skill set to get planing with these is also very high. Foils have the advantage that you can use a much smaller sail, a normal board and the effort to get planing is minimal. That just means more days on the water planing in winds below 10 knots. In the mid to long term it will also be exciting to also see where the performance area of windsurf foiling can go, given the success in other sailing classes like kiting or the America´s Cup. 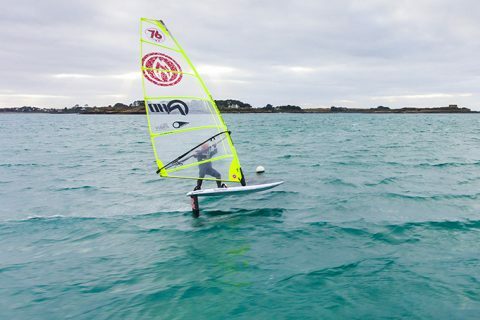 Foil boarding is the latest and hottest trend in windsurfing. We developed two specific shapes for this new dimension of our great sport: HYDROFOIL 135 & 155. The 135 all-round Foilboard makes foiling easy and accessible for everyone who wants to experience the feeling of flying over water. At the same time, it offers racers a very efficient racing machine. The MFC ONE7 is a carbon composite hydrofoil built for freerace foiling. Produced in epoxy resin with biaxial and triaxial carbon to avoid the deadly twist in between mast and fuselage. With a front wingspan of 80 cm, it has a profile section generating the necessary lift to start flying at about 8 knots of wind. • Carbon composite wings with the necessary flex to handle good wind intensity. – Steel inserts in the fuselage where the wing fixings are positioned to allow you to tighten your screws as much as possible without damaging the wings or fuselage. • High performance flex controlled mast. • Longer 89 cm fuselage to allow control and stability, especially at low speed. With a front wingspan of 80 cm and rear wingspan of 42 cm the foil will enable early flying in just 6-8 knots of wind, with an 8.0 sail and 135 litre board. In addition to the large wingspan, the fuselage is 89 cm long, which makes this a super stable and controllable foil to use, whether in light breezes or stronger winds. The mast and fuselage are built in 3K, triaxial and biaxial carbon in one piece to avoid any twisting. 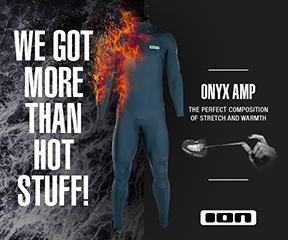 We only use the best materials available on the market to make sure our hydrofoil is super competitive. MFC will be releasing a racing wing set for high speed at the end of the summer. We are currently testing this new setup. 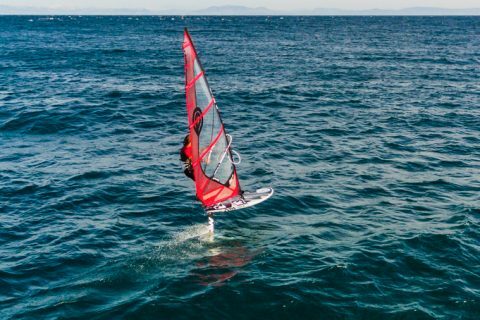 “I see foiling for now as a light wind tool to allow racers and recreational sailors to be able to sail, go fast and have fun in very low wind conditions, 6-12 knots. It will still take some time to develop the correct boards for hydrofoils and the wings will keep evolving, but the mast and fuselages will stay very similar in my opinion. Maybe we will review the length at some point, but this development can be done together with the boards. We are also looking to reduce the weight; we made some very light weight prototypes that we are currently still testing which could be a great advantage, especially in racing. Take to the air with the all-new RS:Flight collection from NeilPryde featuring two options of wind-foils: full carbon and aluminium. The foil program has 2 models, the F4 and AL. The RS:Flight F4 Foil is a no-compromise, performance carbon foil designed in collaboration with F4 USA. This foil is an evolution of the proven F4 windsurf hydrofoil design, already considered as the best wind-foil in the market with unmatched hydrodynamics. • Integrated solid aluminium Deep Tuttle Base for maximum strength, elimination of movement and perfect load transfer. • Eleven titanium bolts for maximum strength to weight ratio while preventing any corrosion problems. • Tail wing adjustment – delivers inverted thrust to balance the main wing and maintain easy control and stability. There is adjustability available by adding a washer on the front or back screw of the tail wing. Foil is perfectly trimmed for average weight sailor (75-80kg) with tail in neutral position. Heavier sailors, especially in light winds or during learning process might prefer slightly more stabilizing force that down tilted rear wing provides. At the same time lighter sailors, especially in strong wind conditions might find a neutral position creates excessive lift and will reduce the differential angle between the two wings by tilting the tail slightly up. In summary – up tilted gives lower lift and less drag at higher speeds; down titled gives more lift and stability at lower speeds. • The mast has an optimised structure for best compromise between strength and minimum drag. Hollow construction to reduce weight combined with three vertical cross-ribs for maximum stiffness and is made of tempered, salt water corrosion resistant 6061-T6 aluminium. • Perfectly blended, wing to CNC machined fuselage connection and integrated wing saddle providing minimum drag. Volume and weight of the aluminium used in fuselage is reduced by eliminating the forward-protruding nose. • Front wing has a specific profile developed for hydro foiling. Constant lift provided in a wide wind range thanks to the angle of attack adjustment as weight shifts forward with speed increases. Extremely durable and easy to fix by sanding. • Vertical directional stabiliser for additional balance while learning. Removable to further reduce drag and increase top speed. If you want to get into foil windsurfing then the Neil Pryde Aluminium Foil is the perfect way to get you started, it’s very durable and an amazing price. 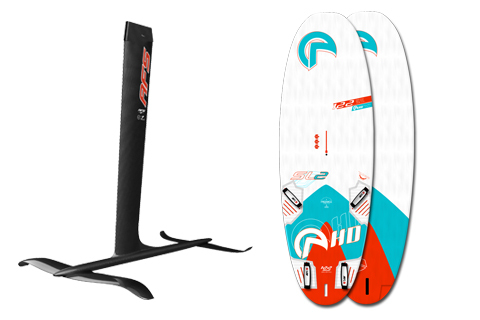 The Thrust WS 1 was developed with Robby Naish to be the ultimate easy access fun foil system. Thanks to its modified delta platform, it launches early, provides excellent flight stability and yet never becomes unmanageable at speed making it the perfect foil for your everyday sailor. The Naish Thrust WS 1 will have you looking forward to the next light wind day instead of dreading it. 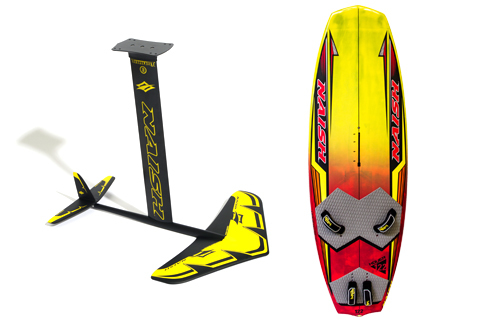 Designed specifically for windsurf foiling, the Hover 122 features a flat rocker which planes easily in light winds. 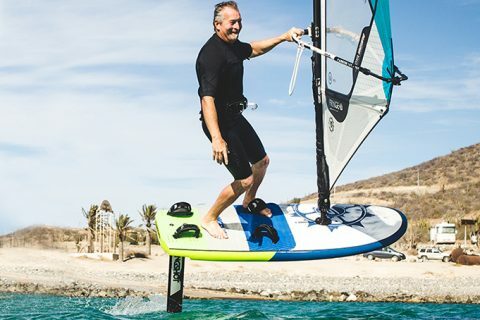 Light and lively with plenty of room to “self-tweak”, the Hover 122 is the must-try foilboard for sailors of any skill level. The Thrust WS 1 features an integrated rudder on the rear wing, tracks well yet still is responsive and intuitive for turns and manoeuvres. The front wing is a medium aspect ratio that provides early take off and enhanced stability for use in extremely light wind. The long fuselage – which adds additional stability – has been modified to move the mast back, making it possible to use the Thrust WS 1 with existing slalom and freeride boards. Naish’s unique stabilizer adjustment system allows the entire setup to be optimally tuned for individual riders to provide more, or less lift. The medium (70 cm) extruded alloy mast can be retrofitted to any style box system with Naish’s accessory board mounts. The Hover 122’s short, parallel outline provides plenty of volume and stability for easy and stable uphaul, eliminating the need for winds strong enough to waterstart. Complimenting its flat rocker, the bottom channel in the tail is strategically positioned to perfect the foil’s angle of attack and generate just enough lift in the nose to guard against ‘pearling’. For a customized experience, our track system allows riders to fine tune the foil position to fit their size and ability: adjusting the foil in a more forward position suits heavier, or more inexperienced foilers, while positioning the foil further back suits lighter, or more experienced riders. Naish is proud to introduce cutting edge foiling technology to the market – bringing accessibility and excitement to the bottom end of the wind spectrum. When embarking on this new challenge our goal was simple – to create a foil that was efficient and accessible, a system that could be enjoyed by a wide range of windsurfers regardless of ability level. We believe in an easy and adaptive “flying” experience and our designs are engineered with convenience at top of mind. Our modular foil system enables riders to easily interchange parts within our foiling programs – regardless of the sport – to create the perfect setup for you. Additionally, our foils can be fitted to any board featuring a track system further expanding your riding options. Rounding out the foil range, our Lift sail was engineered to allow for the use of a much smaller sail when foiling and is offered in a 4.7 and 5.7, eliminating the need for specialty equipment. 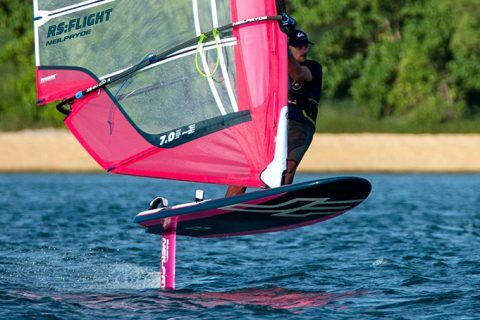 Check out the rest of the foiling range at naishfoils.com to discover the Naish difference. 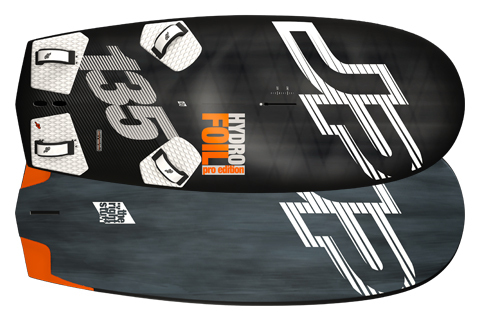 The H-FIRE 91 is the first dedicated windsurf foil board in our collection. 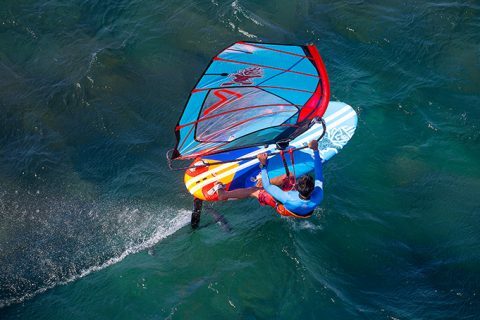 We believe that windfoiling is the latest and most exciting trend in windsurfing, which makes you finally enjoy those light wind days and have proper fun in marginal conditions. 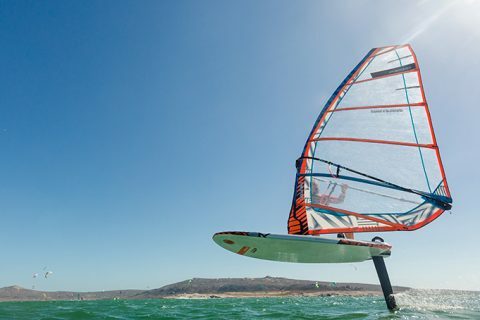 The board’s highest performance is in light wind conditions with 6.5 to 8.0 sail sizes; it allows you to enter the water with 7/8 knots and literally fly on it. The learning curve of wind foiling is very fast, so we have thought about a product that fully satisfies those who have already practiced it and require a high performance board but one that could also be adapted to beginners. The board is 236 cms in length, which is useful for the learning process! In fact it’s very simple to control during touchdowns when foiling at high speed and becomes extra functional once you try your first jibes. You can use it to learn and to go really fast to the next level, where it is loads of fun as a progressive freerider. It has a very wide tail and deck shape. 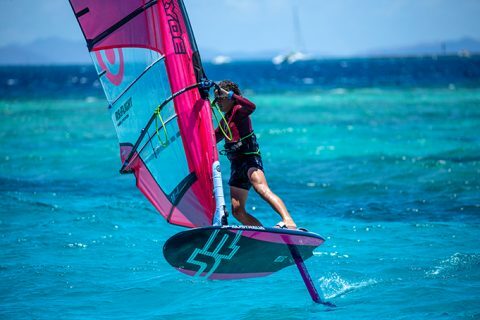 The wide tail makes it easy to get up on the foil and control it, especially when foiling in light wind conditions (8-10 knots) and with big sails in order to have proper support under your feet. The deck shape was designed for a more comfortable ride both in the air and water. 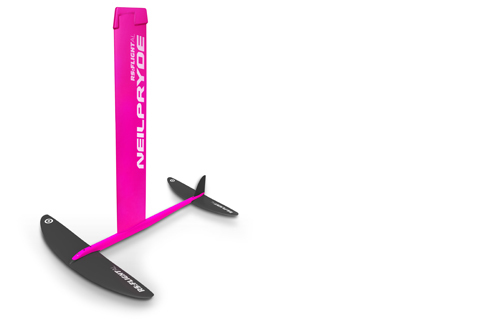 It comes with a specific Hydrofoil resistant Deep Tuttle Fin Box, designed to withstand the strong forces of the foil, the weight of the board, rig and sailor. 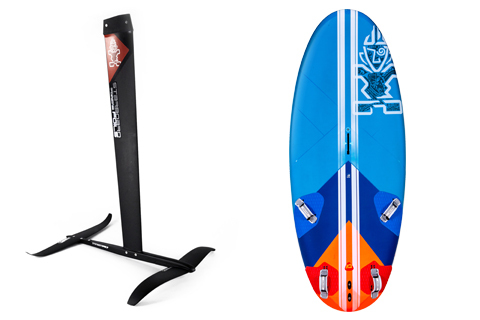 The foil box allows you to ride without fear of breakage and is adaptable for standard fins. The H-Fire 91 was developed in collaboration with Antoine Albeau who has practiced foil at the highest levels for many years. It’s a perfect freeride foilboard, once you are confident with your riding it’s easy to advance your level and keep the hammer down. The 236 cms length is essential when learning and especially at high speed when you need to keep control during touchdowns. The new foil box is robust and allows you to ride in peace without fear of breakage. We strongly believe in the future of windfoiling and spent hours on testing and trying different solutions. Best setup for learning is a 6.5 freeride sail and 9-12 knots. Once you try you’ll be totally involved and want to improve as fast as possible. The learning curve is incredibly fast. In 3/4 days you’ll be able to foil and keep control of the gear and have pure fun. Most relevant is that we will increase our time spent on the water. No more days spent on the beach waiting for the wind, instead we will have active days and physically intensive moments. Foiling can be practiced in marginal conditions and in spots we would never have thought of before. When you see the name Slingshot, chances are you think about a kiteboarding brand. But here’s something you probably don’t know: Slingshot got its start in the wind industry before kiteboarding was even a forethought. Founders Jeff and Tony Logosz were at ground zero in the Gorge, shaping boards and tinkering with gear when the sport exploded and went viral around the world. 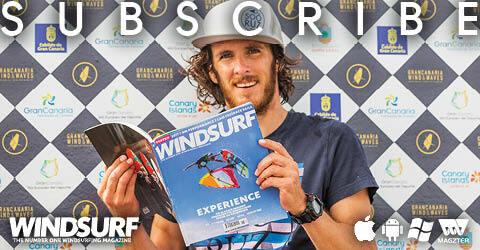 They’ve taken many paths since then, but their passion for windsurfing never faded. Slingshot’s Hover Glide Modular System is the culmination of more than 20 years of addiction to the wind, and if you think their many innovations in the kite industry are irrelevant, think again – it’s exactly the opposite. 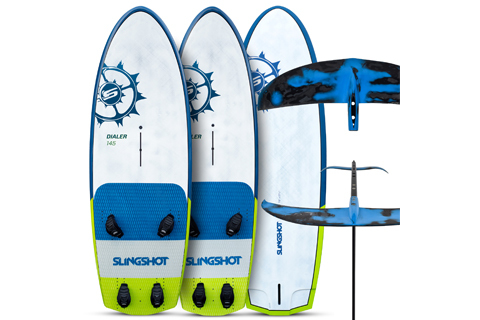 When Slingshot launched its 2018 wind foil lineup earlier this year, they introduced windsurfing’s first modular foil system. The Hover Glide platform is part of an entire lineup of wings, masts and fuselages, all of which are compatible with one another and designed to be interchanged to fit individual’s unique and changing needs. In all, the 2018 Modular line features 5 carbon front wings, 4 aluminium masts, ten carbon masts and five fuselages. the Hover Glide modular system: Slingshot has three additional wings in the lineup, each with unique performance. When you want to SUP, surf, wake or, (heaven forbid) kite with a foil, you won’t have to buy a whole new setup. Fuse: When you buy a Slingshot FWind kit, it comes with the patented Switch Fuse, which can be mounted in two different ways to shift the mast position forward or back. This gives you more flexibility to dial in your setup precisely for your unique needs. For more advanced customization, four additional fuselages are available (the standard Switch Fuse is 78.2cm, additional fuselages are the Pro Fuse short – 71.2cm, Pro Fuse position 1 (starts at 81.2cm), Pro fuse position 2 and Pro fuse position 3, which has the ability to have 3 additional bolt settings for additional length.) Slingshot masts are made from heavy-duty 7071 aluminium – in testing, they found the industry standard 6061 was prone to bending after riders progressed beyond the initial learning curve. Mast: Another Slingshot first in windsurfing is its multi-mast Flight School system. Much like learning to windsurf on a smaller sail, learning to foil on a shorter mast makes all the difference in the world. It’s a proven system that, for many, means the difference between success on the first day and giving up, or never trying in the first place. The modular system features four aluminium masts (35.4”, 30”, 20”, 15”) and five carbon masts with deep tuttle and five with four-bolt connectors (43.7”, 39.7”, 35.8”, 27.9”, 24”). For casual sailors, an aluminium mast is all you’ll ever need. It’s strong, durable and the heavier weight actually adds stability on the water. The carbon option is geared for more advanced or aggressive riders; if you’re going to jump or loop, you’ll want carbon. 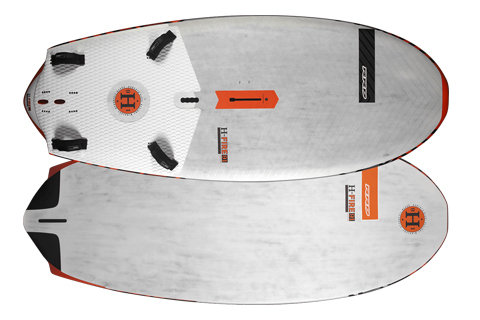 Starboard’s Foil 147 is the foil board and light wind windsurfing board all in one. It is based on the UltraSonic with a reinforced construction, a foil box and extra footstrap inserts to match any foil you choose to fit. The length helps the board glide easily onto the plane and makes it forgiving when dropping off the foil. The wide outline combined with a wide tail helps the board plane up early and gives plenty of control and leverage over the foil. Together with the Foil 147, we are also proud to present Starboard Foils, an open, modular foil platform where wings, fuselages and masts can be interchanged or upgraded to match rider style, budget, conditions or discipline. Starboard’s foil platform consists of two masts, two fuselages, two front wings and two tail wings. The two masts are the Carbon 95 and the Carbon 85. Foil masts have to be stiff and torsionally rigid to achieve controlled flight. The stiffer, the more stable. And the more stable, the more control and performance the foil delivers. Our carbon masts are built in 100% pre-preg carbon, with 40 layers of high-modulus triaxial Toray carbon hydraulically pressed and fused into one monolithic mast of incredible stiffness. For the wings, we found G-10 and glass fibre wings flex too much, no matter what we tried. Flex reduces control and stability while thickness reduces performance. So our two sets of Starboard wings are made in 100% pre-preg Toray carbon. The front wing sizes available are the Carbon 800 cm and Carbon 550 cm. The back wings are the Carbon 330 cm and Carbon 255 cm. The two aluminium fuselages are the 115 cm and the 75 cm. A-B testing showed the aluminium fuselages to be stiffer, tougher, stronger and torsionally more rigid. Since added weight is not a disadvantage in foils, possibly even an advantage, we chose 6061 aluminium for the fuselage construction. A super stiff mast, a hyper-rigid fuselage and full carbon wings would all go to waste if the fuselage fitting wasn’t up to par. Our patent-pending fuselage fitting system allows for convenient disassembly while lateral bolts crank up the fitting pressure between the parts, enhancing torsional rigidity and creating a single, fused high performance unit. Out of these parts, we’ve put together four foil sets ready to fly out of the box: the Slalom, the Race, the GT and the Ultra. If you are just getting into foils, we would recommend starting with the Slalom or the GT. Once you have a Slalom or a GT, you can add an extra wing set or fuselage later to cover more conditions.